Select Wet n Wild gift sets at $4.99, get $4 ExtraBucks, limit 3. $5 ExtraBucks when you buy other select Wet n Wild gift sets, limit 3. Select NYX lip color 2/$11.98, get $10 ExtraBucks on 2, limit 3. CoverGirl Katy Kat products 2/$16, get $8 ExtraBucks on 2, limit 3. 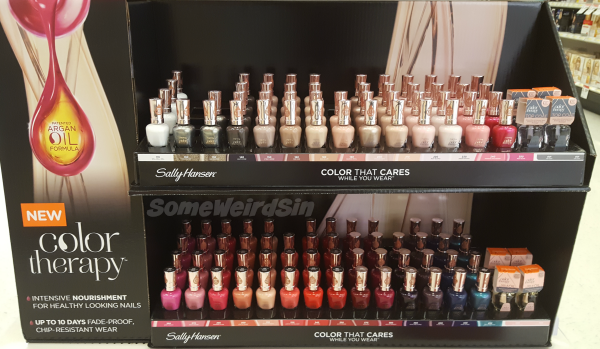 Sally Hansen buy two, get one free (excludes Miracle Gel and Extreme Wear). Revlon classic nail polish $4.99, get $3 ExtraBucks, limit 6. Select Physicians Formula mascaras $9, get $9 ExtraBucks. 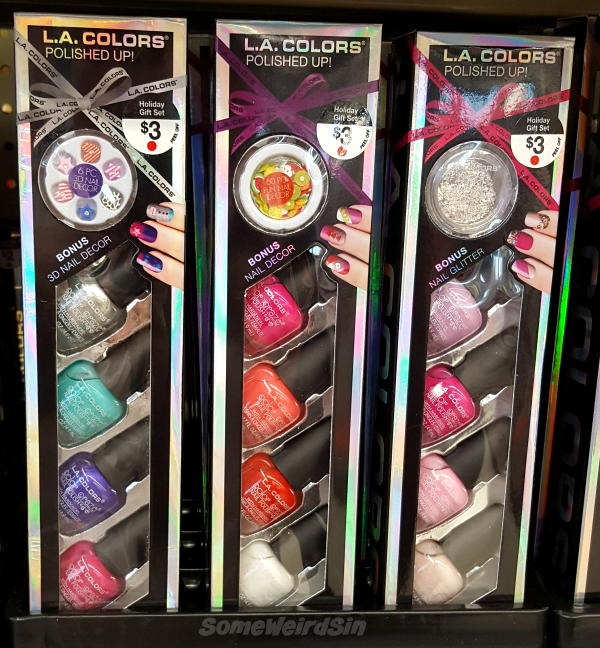 Rite Aid - Wet n Wild nail gift sets $2.99. 5/$5 on Sinful Colors nail polish. 25% off regular priced items with coupon in circular. 50% off select Wet n Wild gift sets. 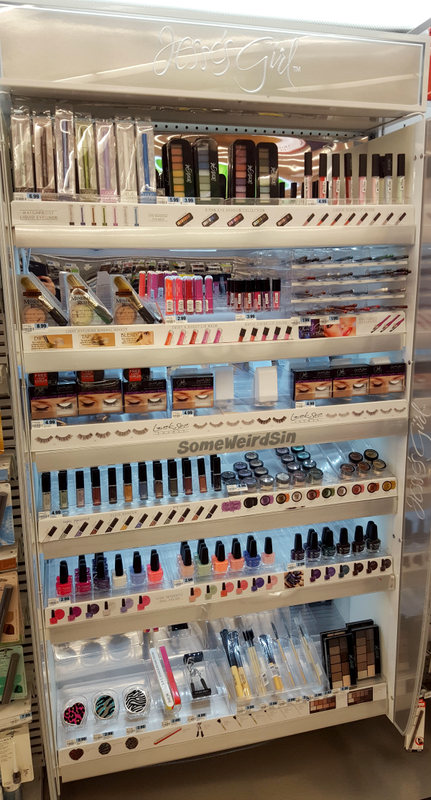 There are also a few week-long sales worth noting, especially if you like Revlon. 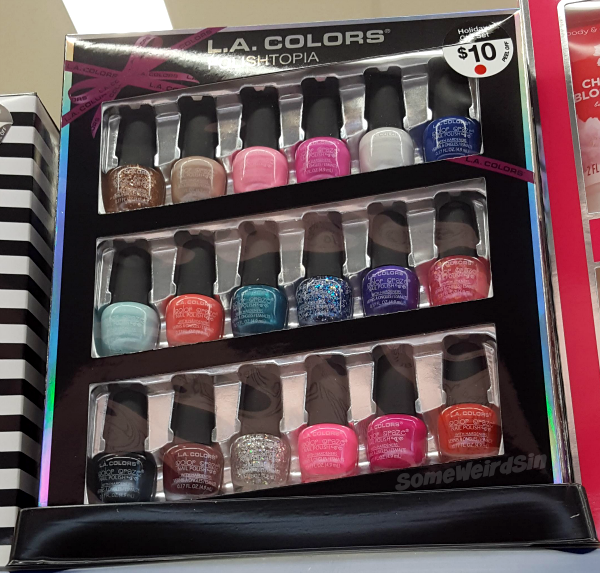 CVS - Revlon classic nail polish $4.99, get $3 ExtraBucks, limit 6. Buy the Wet n Wild mascara mini gift set for $4.99, get $4 ExtraBucks. 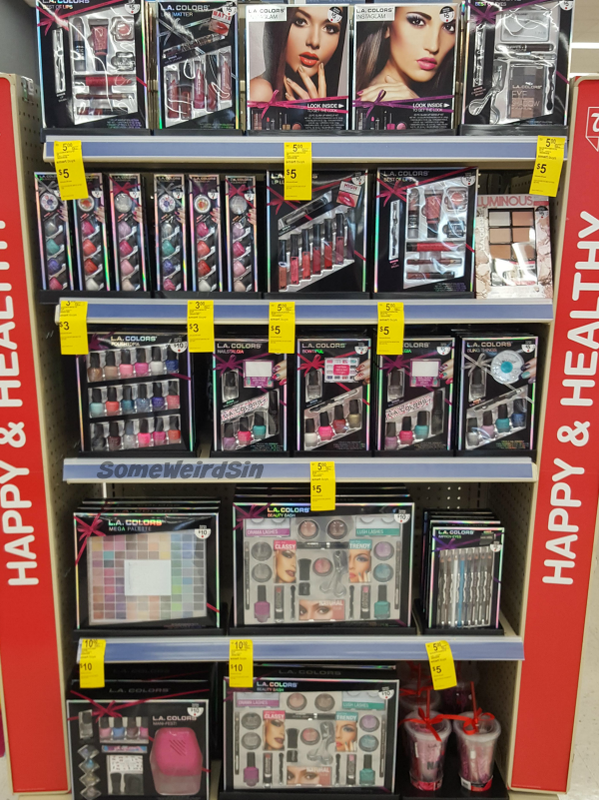 Rite Aid - 40% off Revlon face, nail, and eye. Walgreens - 40% off Revlon. Oh and one more. Get 25% off beauty and personal care at Target on Tuesday, 11/22 when you text BEAUTY to TARGET (827438). I bought my first Defy & Inspire polish during my unintentional two month hiatus. Haven't worn it. That didn't stop me from snatching up all four of the new minis from this holiday display. They're flecky foils and far more sparkly than this photo is showing. One caveat though...they're super tiny at just 0.17oz, which makes the $2.99 shelf price pretty steep. I had a $5 gift card, so I didn't hesitate. If you can get to Target on Tuesday and take advantage of the 25% off text code that I mentioned above, you can get them for $2.24 each, which is a little bit better. That's all four for just under $9 instead of $12. I still haven't bought any Bonita, but...as always, I'm tempted. Look at that bronze on the end! Ooh! 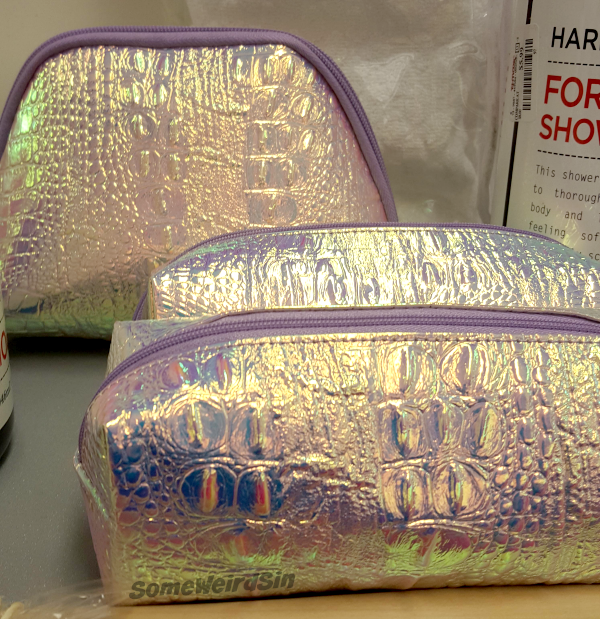 If this display is what I think it is, these will be the new core shades in January. So there might be no rush to get them...but that 5/$5 sale... I know I'll be grabbing them! There's also a holiday collection called Santa Bae, but I haven't seen it in stores yet, so I don't have a photo. I might sneak back into this post and fix that soon. Call me skeptical, but did they just add a trendy ingredient and gold caps to existing Complete Salon Manicure shades? Sure looks like it! Walgreens is all about L.A. Colors gift sets this year! Look at all of them! You've probably seen this collection already, but...oh well...here it is again. I bought all four polishes when I found them at CVS. 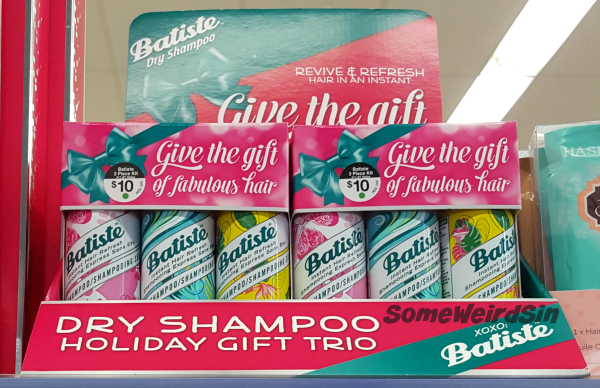 Looks like Rite Aid got the best Wet n Wild gift sets this year. Four mini 1 Step Wonder Gels for $9.99 is a good deal! I don't think it's part of the $2.99 sale, but it'll probably be on sale at some point this season. Wow...downsizing! I was hoping they'd be adding new stuff. They kinda did. The satins from fall '14 are core now, which is cool. I swatched Cauldron back in the PGS days. Batiste is some of the best dry shampoo I've ever used. These gift sets have three different scents...but no brown. Phooey. They have a dichroic (think duochrome on steroids) finish that shifts around all over the place.